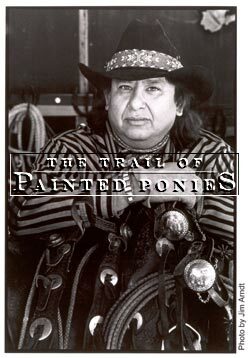 Amado Maurilio Peña Jr. has been one of the biggest names in the field of Southwest art for decades. He is the recipient of numerous Native American Artist of the Year awards. He has been featured as the Grand Marshall at various fiesta parades, handed the keys to different Texas cities, served as the national spokesman for the March of Dimes, and presented with the 50th Star on the Texas Walk of Stars. Oh yes, did we mention that he was also invited to embellish two life-size Painted Ponies, one of which, "Caballito", has become a best-selling collectible figurine? We tracked down Amado to find out how he felt about this latest achievement and found him at an art show in Breckenridge, Colorado. There was a time when Amado primarily exhibited his work in art galleries, but he changed direction a few years back, when some of the galleries fell on hard times. He decided to take an aggressive approach to marketing his own art, and began attending more art festivals. "I was averaging two one-man shows in galleries each month anyway, so this isn't so different, and this way I not only get to reunite with former collectors, I make a lot of new contacts." It has been said that Amado Peña's artwork is the essence of the Southwest. It is known for its bold colors, forms and dynamic composition, the intensity of the hues and the unexpected spatial relationships. Abstractions of the landscape merge with exaggerated human forms, blankets and pottery patterns. But no matter what his medium - and he works primarily in watercolor and etchings - the recurring motif, the trademark that gives his work instant recognition, is a modeled, angular profile of an Indian man or woman. The idea of using profiles "has to do with a storytelling approach that I want for my art", according to Amado. "I wanted a way to get my message across easily and immediately, and short of drawing a stick figure pointing, using a simplified profile of a figure was an alternative." Amado's own story began on the streets of Laredo, Texas where this mestizo of Chicano/Yaqui heritage was born. His father, a firefighter for 49 years, had been raised on a working ranch and had the good sense to feel his children should have a broader experience than the city of Laredo, which is how Amado came to spend time with his uncle on a large South Texas ranch, where he was first exposed to horses. He was the only member of his family with artistic inclinations, and the interest was strong enough, his talent large enough, that it shaped his educational choices. His working resume begins with his position as a Student Assistant in the Art Department, graduates to Art Instructor, and goes on to list Chairman of the Art Department before becoming Superstar Artist. Making a living as an artist has always been a hallmark of success for Amado, which explains how his art shows up on tiles and T-shirts, as greeting cards and as posters that hang in offices, hotels, living rooms, airports and restaurants around the country. He is continually exploring the commercial possibilities, which led him to see if his artwork could be adapted to jewelry and clothing. At the same time, he has been equally generous with his artwork when it comes to charity. He started his own Art has Heart Foundation, that raises scholarship money for underprivileged youths, and he responded enthusiastically when given the opportunity to paint a Pony. Immediately, he found himself confronted with challenges. He had never painted on a three-dimensional canvas before, and certainly not one of life-size scale. He hadn't worked with acrylic paint since college, so he was going to have to re-acquaint himself with a medium that was different from the watercolors he was used to. He wanted his imagery to have a signature Peña look, but he was more concerned about choosing a palette of colors that conveyed movement at the same time it connected the head, body, legs and tail, and that communicated a relationship between the landscape, the horse, and mankind. The result - Caballitoscape a la Estrellas - was a huge success, raising almost $20,000 for charity, giving Amado another artistic accomplishment, and, after it was crafted into the figurine "Caballito", providing his friends and fans with another way to collect Peña. 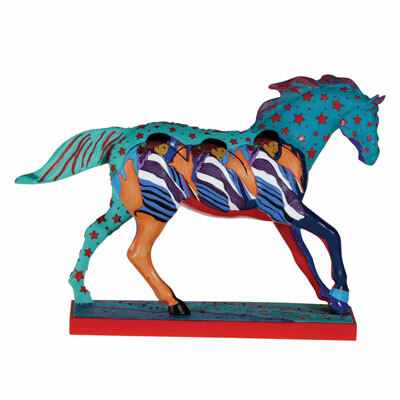 Caballito, a collectible figurine inspired by Amado Peña's "Caballitoscape a la Estrellas". A horse ranch in Nambe, New Mexico, just north of Santa Fe. The Mexican muralists. As a university student I studied them - from pre-Columbian to contemporary - and was impressed with the magnitude of their artwork, and its storytelling power. "Waltzing Across Texas". Anytime it comes on, I get up and two-step. Turquoise. It is beautiful, and it has protective powers. Favorite Words of Advice: Be respectful. My dad. He was an incredible human being. He loved his family, but he also had a big heart and could make a stranger feel like an old friend. I don't think of him as having passed away. Everywhere I turn, he's there.